premiere escape room game, to bring you an immersive horror experience like no other! ... you must now also SURVIVE! You and your friends will be trapped in a room and will have 45 minutes to try and survive the horror set before you. There will be scare actors that will enter and exit the room as they please. Some will be nice and try to help you by giving you clues, while some... are not. Be prepared as they invade your personal space, tell you bone chilling stories, separate you from your friends and sometimes, even leave you alone in the dark. Be ready to be pushed out o f your comfort zone. If the scares get too extreme for you, there is a safe word... screaming “I want my mommy” will signal our actors to back off and bring you back to your friends. Though be warned, doing so will forfeit the clue you may receive by surviving the scare. Missing out on 1 clue won’t make it impossible to solve the puzzle, but it will make it very difficult. So wear your brown pants and as much as you can, brave up! 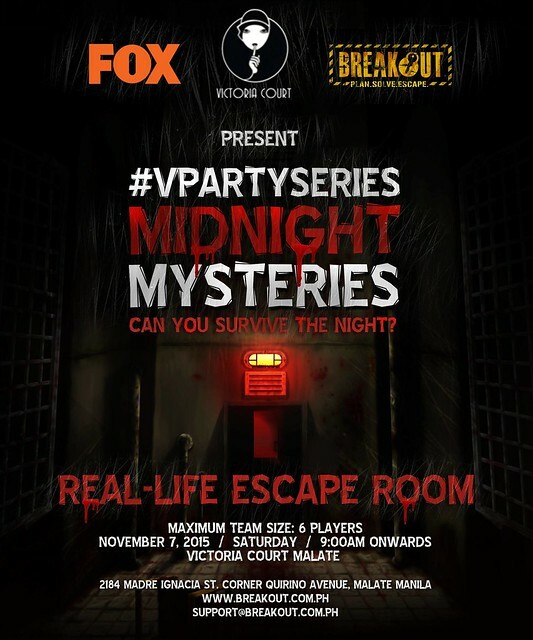 If that’s not enough, Breakout Philippines is also teaming up once again with FOX to bring you The Walking Dead Breakout Room. As if time pressure is not enough, you and your friends have to escape while trying to keep your wits together as a flesh- eating walker breathes down your necks. This is happening at TriNoma Level 4 Garden Restaurants (until November 14 only) and at the Breakout Katipunan Branch.